Moms are under so. much. pressure. Pressure that weighs us down and threatens to wipe us out. Are you ready for relief? Mom Set Free will empower you to parent in the confidence of God's grace and to experience the freedom you were created for. These impossible standards leave us stuck in worry, anger, guilt, comparison, and shame. Jeannie Cunnion gets it. And in Mom Set Free she reveals how the Good News of the Gospel empowers us to live—and parent—in the freedom for which Christ has set us free. * Lay down what God has not asked us to carry so we can thrive in what He has. * Embrace our significance in our children’s lives in light of God’s sovereignty. * Trust God with the children He has entrusted to us. * Receive God’s grace so we can reflect God’s heart to our kids. It’s time to breathe deeper, walk lighter, and reclaim the wonder and adventure of parenting. During my first pregnancy, I can clearly remember people—friends and strangers alike—telling me how much I would love being a mom. How I would love my son so much that I would feel like my heart would burst. And they were right. The moment the nurse laid my newborn son’s bare body on my chest and I felt his heart beat against mine, I knew there was nothing in this world I wouldn’t do for him. My instantaneous love for him overwhelmed me. That newborn baby is now a teenager, and I am still caught off guard by how the very sight of him, along with his three younger brothers, slays me. However, what I don’t remember anyone telling me before my first son was born is that motherhood would not only enlarge my heart but it would also expose all my weaknesses and inadequacies, and that there would be days when I’d feel so desperate that I wouldn’t even recognize myself. I didn’t see that coming. I didn’t expect that motherhood would reveal both the beautiful and the not-so-beautiful parts of my heart. I recently attended a baby shower for a young woman named Nicole. She was a soon-to-be first-time mom and a woman I very much admire and adore. To call her wise beyond her years would be an understatement. The shower was a joyous occasion, as all baby showers are, but the joy at this shower was palpable. Nicole and her husband, Jimmy, had long prayed and hoped for this “miracle baby” whom we were all eager to embrace and celebrate. However, just about halfway through the celebration, I felt a strong inclination to pull my friend aside and warn her that parenting isn’t all petits fours, pink lemonade, and filtered Instagram photos. Perhaps it was because I was on the tail end of a very defeating week of parenting. The kind where my joy was lost in the battles. Failures outweighed victories. Fighting trumped kindness. All my intentionality felt worthless. And I was mentally and physically wiped out. You’ll be happy to know I didn’t ruin the shower. I focused on the gift this child will be to Nicole and Jimmy. But soon thereafter, Nicole and I grabbed coffee and, because I love her, I shared with her some of the things I wish I’d known as a new mom. This parenting thing is hard. Really hard. And there will be a lot of mornings when you want to pull the covers over your head and stay in bed because you don’t have the mental, physical, or emotional strength to meet the demands of the day and be the mom you want to be. And when you do muster up the strength to put your feet on the floor and take that one next step, you will want to say, with the little energy you can summon, “Who wants to play hide and seek? Doesn’t that sound like fun! Okay, so you go hide, and be sure to find a really great spot where I’ve never found you before, and Mommy will come look for you after I count to five hundred.” Yes, you will do this because you are falling apart. It won’t mean you don’t love your children with all you have. It just means you’re human. And that’s okay. And you will make mistakes. Lots of them. And you will have regrets. Big ones. And you will need Jesus like you’ve never needed Him before! But, girlfriend, what I most want to tell you is this: On the days when you feel like you’re not enough, hold on tight to the truth that you have a Savior who is enough. And what is hard for you is not hard for Him! So run to Him. Rely on Him. Depend on Him. Isn’t that what we most want to hear? We all need another mom to affirm the “crazy” we feel. We need to know that we’re not the only one whose fierce love for our children coexists with feelings of failure and desperation. We all need another mom to remind us—over and over again—that we have a powerful God who has given us His perfect son, Jesus Christ. And He is our enough. When we’re feeling pushed far beyond our human limitations, and we look in the mirror only to find our face worn and weary with the day’s demands, we can turn to God’s Word and read the relief God promises. Even youths will become weak and tired, and young men will fall in exhaustion. • God does not lose track of us. • God very much cares what happens to us. • God’s knowledge and understanding cannot be measured. • God never grows weak or weary. • He knows everything. Every. Single. Thing. • He gives power to the weak. • He gives strength to the powerless. What we learn through the words of Isaiah is that who God is, which is sovereign, and what He gives us, which is grace, is enough. And He wants us to trust Him. When we’re exhausted—both mentally and physically—He wants us to rely on Him to be all that we need. He wants us to recognize that parenting is actually meant to—designed to—deepen our dependence on Him. He is wooing our hearts closer and closer to His in and through our kids. I have clung to this verse for years. In fact, I most love the New American Standard translation that says, “Cease striving and know that I am God.” I’ve recently discovered something that makes this verse even more meaningful to me. The Hebrew meaning for “be still” is “enough.” Oh, how profound this is for our lives and for our parenting. He is saying, Enough of trying to be enough! Whether you’re in the middle of raising tiny babies, tantruming toddlers, tenacious teenagers, or adult kids, you’re likely well acquainted with the hopeless feeling of being “not enough” for your children. But here’s the thing. As we seek to overcome the pressure we feel to be enough for our kids, we also have to take an honest look at the pressure we feel to be enough for God. See, most of us aren’t just trying to be enough for our kids, which is the horizontal pressure we feel. We’re also trying to be enough for God, and that’s the vertical pressure I want us to talk about honestly on this journey together. And when it comes to parenting—where we experience the horizontal pressure to prove we’re enough—we just keep searching for newer and better ways to control our child’s behavior, secure our child’s success, or change our child’s heart. And none of it works—at least, not for long. Is it any wonder that under all this pressure we crack? Are you tired of being the mom who is barely stumbling along, crushed under the pressure to be “enough”? Are you tired of feeling that you can’t catch your breath, can’t keep up, and can’t be all that your children need you to be? Are you tired of being tired? I spent entirely too long trying to prove to myself, to God, and to everybody around me that I was enough. Only in recent years have I begun to understand what Paul meant when he said that in our pursuit to be enough, we deny and reject the work of Christ—it’s as if “Christ died for nothing” (Galatians 2:21 NIV). In other words, if we ever had a shot at being enough, then everything Jesus endured on our behalf to reconcile us to God was pointless. God never called us to be enough. Not for Him and not for our kids. Not for our spouse and not for our church. He calls us to be loved. To be His beloved. This title has been gifted to us and can never be taken away from us. All because of Jesus. So we can stop trying to be enough because Jesus was, and is, our more than enough. So the next time we wrestle with the question “Am I enough?” rather than try to justify our enough-ness, let’s see our question as a cue to recall the preeminence of Christ in our lives and our daily mothering. We can unashamedly proclaim, as Charles Spurgeon once said, “I have a great need for Christ. I have a great Christ for my need.” It is only in this confession—“I have a great need for Christ”—that we are relieved from the guilt of not being all we desire to be for our kids. It is then that we become grateful for all that Christ already is for them. Jesus freed us from trying to prove that we are enough. He lived a sinless life, died a sinless death, conquered the grave, and has freely given us His perfect record (Romans 3:23–25 NIV).When we are in Christ, there is nothing to prove. Let that sink into your weary and worn-out soul. We get to rest in the assurance of God’s grace and His sovereignty over us and over the kids we long to love and lead well. We are free! Rest assured, when I say “We are free” I don’t mean we’ve been given an excuse to be a lazy or lousy parent. This is not a permission slip to give up. This is not an out. This is an in. An invitation to trust that “everything that goes into a life of pleasing God has been miraculously given to us by getting to know, personally and intimately, the One who invited us to God. The best invitation we ever received!” (2 Peter 1:3–4 MSG). We have been personally invited—by name—to walk in freedom from the pressure to be “enough”—for our children and for God. Let’s turn now to see how this freedom applies to some of the immense pressure we face in our daily mothering! 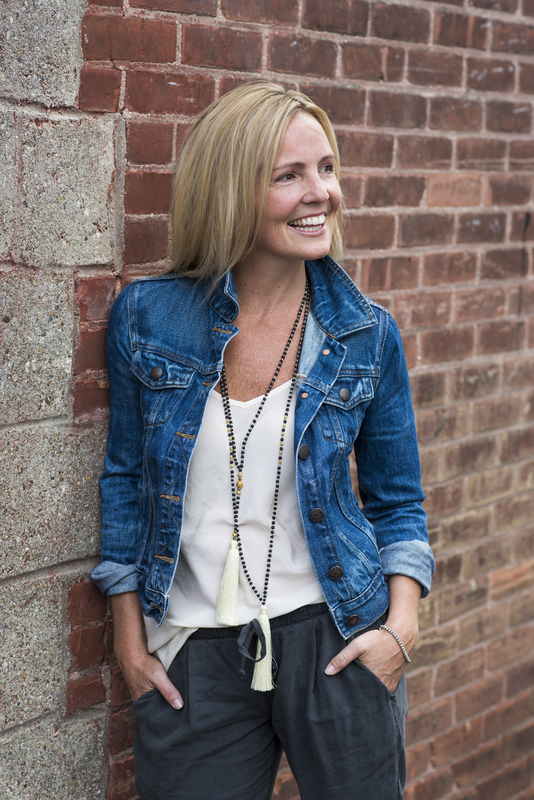 Jeannie Cunnion is the author of Parenting the Wholehearted Child and Mom Set Free, as well as a frequent speaker at women’s conferences and parenting events around the country. She holds a Master’s degree in social work, and her writing has been featured on outlets such as the TODAY show, Fox News, The 700 Club, and Focus on the Family. Jeannie and her husband, Mike, have four boys. "Jeannie helps us to "breathe God's grace" into our own hearts so we can shower that same grace on our children." "Reading Mom Set Free is like that first breath of fresh air you take after being under water for too long. Jeannie skillfully shows us how the gospel gives life, freedom, and rest." “Jeannie beautifully brings the transforming power of our freedom in Christ into the everyday mission field at our kitchen tables. With sound theology made practical and applicable, Mom Set Free takes the pressure off of our performance and points us to God's faithfulness through Christ." Ruth Chou Simons, mom of six boys, artist and author of GraceLaced: Discovering Timeless Truths through Seasons of the Heart. Sissy Goff, M.Ed., LPC, director of child & adolescent counseling at Daystar Counseling Ministries, Nashville, TN; speaker; and author of Are My Kids on Track? 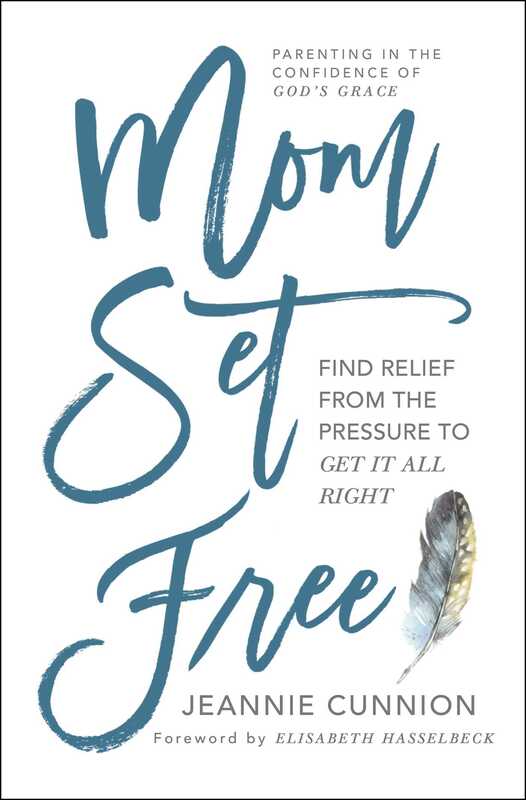 “In Mom Set Free, Jeannie uses God's Word to create a beautiful quilt of rest and encouragement while exposing and embracing the heart struggles of every mom. Mom Set Free is full of God's unconditional love, affirmation, and Truth for His daughters." Wynter Pitts, author of She is Yours and founder of the magazine For Girls Like You and resources for girls.